The Cambridge University Acrobatic Rock'n'Roll Team is always keen to recruit new members. Whether you were impressed by one of our performances and want to get involved, or you've been coming to classes and want to take your dancing and acro further, joining the team is the best way to advance to the next level, and have a great time in the process! No prior experience (with Rock'n'Roll, acrobatics, dancing or other) is required. If you're interested in joining, please come to the University Sports Centre on West Site on Sunday 11th October 2015 at 5:30pm or on Wednesday 14th October 2015 at 7:30pm. On both occasions, we invite you to just join in our practice/coached session. Wear sports clothing and comfy trainers, and bring something to drink. There is absolutely no need to bring a partner but if you do have one, please bring them along. If you like training with us, let us know. We're looking forward to meeting and dancing with you! If you cannot make either of these sessions, then email us at rnr-at-cambridgedancers-dot-org, use our contact form or come find a team member at one of our events or stalls during Freshers' Week. We're very lucky to have three excellent teachers, Guido, Cristina and Steve, who are responsible for Cambridge having the best Rock 'n' Rollers in the UK! 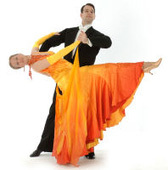 Guido & Christina teach the three beginners classes while Steve is involved as coach in training the team, with advanced footwork and acro moves, and offers private tuition for the keenest among us - very useful before competitions! We also have good contacts within the European Rock 'n' Roll community, and arrange workshops in Cambridge where we have 1-2 days of intense training with professional Rock 'n' Rollers. ...and bring home ALL the trophies! There are many student dance competitions across the UK, including regional (SUDA) and national (IVDA) competitions. Cambridge couples have dominated the competitive circuit for many years, and we always come home with all the trophies! ...for training camps of international competitions! Since 2007, Cambridge couples have attended a large Rock 'n' Roll training camp in Sweden - 4 days of intense acro and fast footwork training, with world-class coaching. Some of our best couples have also entered the European Rock 'n' Roll Championships, and with the help of the recently formed British Rock 'n' Roll Federation, we're hoping to enter more couples from Cambridge in the next competition. ...and do Rock 'n' Roll anywhere! People are always impressed by the acrobatic moves that are taught and perfected within team training, and we enjoy doing them as much as people like watching them! You'll often find team couples showing off their favourite moves at parties, or even in holiday photos! ...and enjoy the rest of the night off! The Team is regularly booked to perform and teach at Cambridge May Balls, where we show off our latest team and individual routines, and then teach ball-goers some basic authentic steps to dance the night away! Usually, we get to stay and enjoy the ball for the rest of the night! ...with the friendliest people around! The people in the Rock 'n' Roll Team are some of the friendliest and most enthusiastic around! Made up of current and ex-Cambridge students (as well as some locals), there are regular team socials, parties, and trips - and you can guarantee that there'll be dancing and acro at all of them! Recent highlights include a trip to Sweden for a dance camp, a camping trip on the Norfolk coast, and the coaches' BBQ.